193 governments including those of India, committed to reducing burden of non-communicable diseases (NCDs) such as cancers by 25% by 2025 and one-third by 2030 (UN Sustainable Development Goals or SDGs), but many cancer rates are rising, not declining, especially in several high burden countries. Cancer is the second leading cause of death globally (cardiovascular diseases (CVDs) are the top killers). Estimated 9.6 million people died due to cancer in 2018. Tobacco use is the most important risk factor for cancer and is responsible for approximately 22% of cancer deaths. 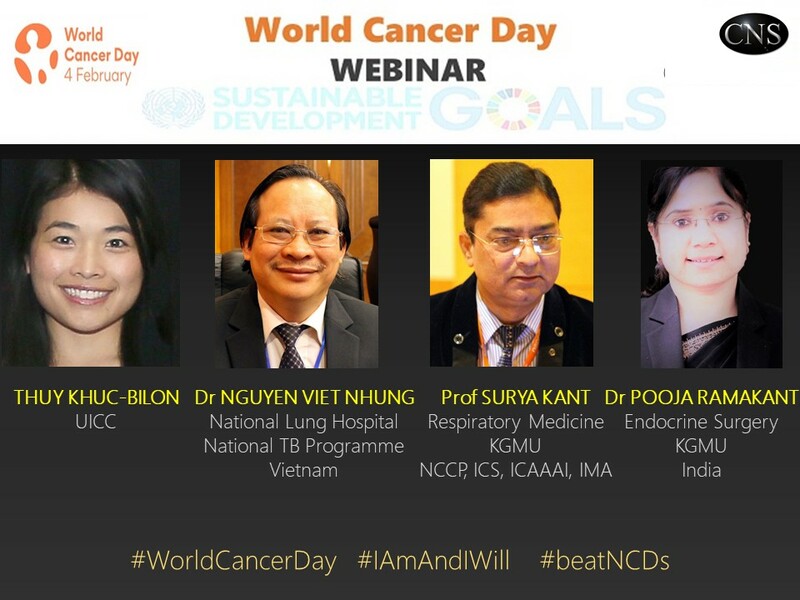 Two most common cancers according to the World Health Organization (WHO) are lung cancer (2.09 million cases and 1.76 million deaths in 2018) and breast cancer (2.09 million cases and 627,000 deaths in 2018), said Professor (Dr) Surya Kant, Head of Respiratory Medicine Department of King George’s Medical University (KGMU) in the World Cancer Day 2019 Webinar. Prof Surya Kant reiterated that according to the WHO, at least one third of common cancers are preventable through tobacco and alcohol control, healthy diet, maintaining healthy weight and being physically active. “Smoking is linked to 71% of lung cancer deaths, and accounts for at least 22% of all cancer deaths” said Prof Surya Kant who heads the Tobacco Cessation Clinic of KGMU and was elected as National President of Indian College of Asthma, Allergy and Applied Immunology (ICAAAI). “Tobacco use is the single largest preventable cause of cancer and stopping smoking and tobacco use in any other form, is one of the best things we can do to reduce our risk of cancer. Use of tobacco has been found to cause around 15 different types of cancers including oral cancers, lung, liver, stomach, bowel and ovarian cancers, as well as some types of leukaemia (blood cancer). Quitting tobacco use at any age can make huge a difference, increasing your life expectancy and improving quality of life” added Prof Surya Kant. This article was webcasted on February 05, 2019.